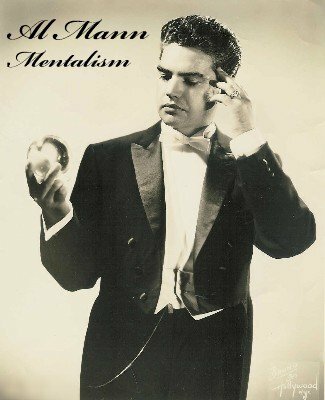 Al Mann was one of the most creative minds in mentalism. Author of over hundred pamphlets with such intriguing titles as 'The Tesseract', 'Page of Swords', 'The Kolophon', 'Acidus Plus' Martin Breese managed to persuade him to make an audio recording in order that mentalists may get to know him better. You will hear Al Mann describe how he first became involved with magic. He details some of his experiences and early influences and describes an effect which is seldom seen today - reading a message in the dark. Bert Reese is discussed and his methods described. Al knew Dunninger and often discussed the art of mindreading with him. Here Al describes how Dunninger would work on the radio and TV. The Center Tear comes in for the Al Mann treatment and he describes an incredible gaffless headline prediction that he worked out with Richard Himber. Also described on these MP3s is a prediction idea to beat them all. You make three predictions. All three are passed to the audience so that they can read them before the events take place. Despite the apparent fairness of the procedure the predictions all prove to be correct. If you already perform stage mentalism you'll want to add this idea to your act. There is much more on this recording which provide insight into a man who has given so much to mentalism. You will get 13 MP3 files to load on your iPod, computer or other MP3 player. This is a licensed reproduction of a two volume set of the famous Magicassette series created by Martin Breese - now owned by Lybrary.com. For thirty bucks, you get detailed descriptions of one of the most impossible headline prediction effects (which, by itself, sold for more than $30 a couple of years ago), plus other prediction methods, PLUS other mentalism effects which were and are ahead of their time. And that's not even the best part of these audio files! Al had so much to say, so MUCH good advice for the performer and creator, that it's amazing it didn't take the entire day to relate. His conversational style makes this a pleasant listen, and you WILL want to listen more than once -- at least once, you'll want to take copious notes.